This week, the gang gets back together. Well, sort of. Okay, so the survivors are still split into three separate groups, but we get to see everyone in action for the first time in ages. It's the penultimate episode of the year, so if it feels a bit like this is all a long set-up for the mid-season finale then, yes, it is. Happily, “Crossed” is also thoroughly entertaining. Project: Rescue Carol is at the centre of it all. Rick's plan – pretty much: shoot people – is trumped by Ty's more peace-loving solution. After that nasty business with the cannibals, both Ty and Daryl are more interested in jaw-jaw than war-war. They're sick of violence, which is understandable. Still, given the nature of Dawn and her thugs, you can't help but think that Rick may be proved right in the end. The episode's highlight is the kidnapping of three of the Grady cops. It's a nicely-staged battle, complete with a chase through some of the grottier parts of Atlanta and then an ace scrap between Daryl and Licari (love the use of a zombie head as a weapon). It's interesting to see Rick becoming increasingly harsh in his attitudes. He really wants to kill Licari and it's only an unusually level-headed Daryl that stops him. Let's talk about Lampson. He's an intriguing one, our Bob. For most of the episode he's playing the archetypal Good Cop. He's reasonable, peace-loving and willing to go along with Rick's gang if its mean saving lives. But, as that final head-smash proves (one of four double-crosses in the episode, if you count Eugene's), he's got an agenda of his own. Is he still working for Dawn? That doesn't quite fit with his actions – why set up a peaceful solution and then scupper it? Whatever the case, he's certainly tricksy, first winning over Rick with his (rather on the nose) “hey, are you a cop? Me too. High-five!” dialogue and then grieving Sasha by, er, having the same name as her ex. If you think Officer Lampson looks familiar then that's probably because Maximiliano Hernández has played another sneaky git: Jasper Sitwell in the Marvel movies. Speaking of the Grady bunch, Dawn grows ever more dislikeable, effectively sentencing Carol to death and then manipulating Beth. She's more incompetent than evil, desperate to retain power at all costs. That's a dangerous combination and I'm not convinced that all of our lot are going to make it out of next week alive. That said, there are glimmers of hope here. Abraham's story goes literally nowhere – he spends the entire episode sitting in the middle of the road – but that affords Glenn, Maggie, Tara and Rosita the chance to hang out and play with yo-yos. And that's fun. Tara gets to be quippy and sparky, without becoming the Officially Sanctioned Comic Relief Character. Maggie shows some fire and anger (I'm digging her wild west, gunslinger style, incidentally), Rosita stands up to Abe and Glenn starts to show more of his leadership skills. It's a nice breather from the intensity of the rest of the episode. Unfortunately, the scenes with Gabriel are a drag. It's entirely reasonable that he would be having a bit of a freakout after all the carnage he's seen. And yes, his failure to kill an injured walker is entirely in keeping with his character. But he's starting to feel like a distraction from more pressing matters. Perhaps he will come into his own next week, or maybe he'll die. Whatever. For now I'm more interested in what's going on at the hospital. It's gotta be the really grotty and wasted ones the gang face as they chase the Grady bunch through Atlanta. Properly nasty. Not a typo, but the name that Tara gives to Team Abe (or is it Team Glenn, now?). Doesn't quite trip off the tongue, does it? 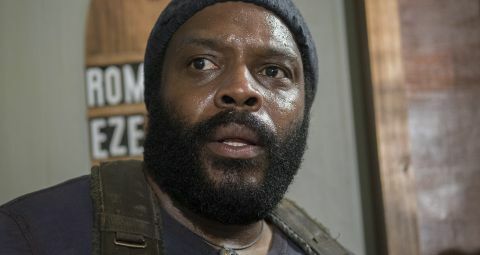 The team set out to rescue Beth and Carol, and Abraham throws a massive hissy-fit.